Fig. : Seeing into a fly's brain: Neurobiologists use state-of-the-art methods to observe the activity of nerve cells while the fly sees moving stripe patterns on a LED screen (left). 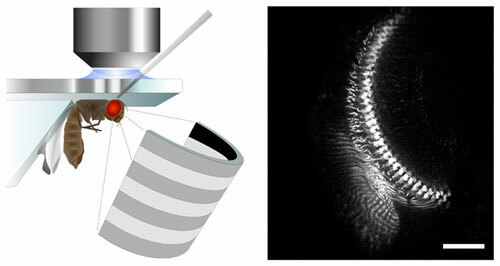 This technique enables the scientists to observe the response of single cells in the brain area which processes motion information (right, scale = 20 micrometer). Back in 1956, a mathematical model was developed that predicts how movements in the brain of the fly are recognized and processed. Countless experiments have since endorsed all of the assumptions of this model. What remains unclear, however, is the question as to which nerve cells are wired to each other in the fly brain for the latter to function as predicted in the model. "We simply did not have the technical tools to examine the responses of each and every cell in the fly's tiny, but high-powered brain", as Dierk Reiff from the Max Planck Institute of Neurobiology in Martinsried explains. That is hardly surprising, considering the minute size of the brain area that is responsible for the fly's motion detection. Here, one sixth of a cubic millimetre of brain matter contains more than 100,000 nerve cells - each of which has multiple connections to its neighbouring cells. Although it seems almost impossible to single out the reaction of a certain cell to any particular movement stimulus, this is precisely what the neurobiologists in Martinsried have now succeeded in doing. The electrical activity of individual nerve cells is usually measured with the aid of extremely fine electrodes. In the fly, however, most of the nerve cells are simply too small to be measured using this method. Nevertheless, since the fly is the animal model in which motion perception has been studied in most detail, the scientists were all the more determined to prize these secrets from the insect's brain. A further incentive is the fact that, albeit the number of nerve cells in the fly is comparatively small, they are highly specialized and process the image flow with great precision while the fly is in flight. Flies can therefore process a vast amount of information about proper motion and movement in their environment in real time - a feat that no computer, and certainly none the size of a fly's brain, can hope to match. So it's no wonder that deciphering this system is a worth-while undertaking. "We had to find some way of observing the activity of these tiny nerve cells without electrodes", Dierk Reiff explains one of the challenges that faced the scientists. In order to overcome this hurdle, the scientists used the fruit fly Drosophila melanogaster and some of the most up-to-date genetic methods available. They succeeded in introducing the indicator molecule TN-XXL into individual nerve cells. By altering its fluorescent properties, TN-XXL indicates the activity of nerve cells. To examine how the brains of fruit flies process motion, the neurobiologists presented the insects with moving stripe patterns on a light-diode screen. The nerve cells in the flies' brains react to these LED light impulses by becoming active, thus causing the luminance of the indicator molecules to change. Although TN-XXL's luminance changes are much higher than that of former indicator molecules, it took quite some time to capture this comparatively small amount of light and to separate it from the LED-light impulse. After puzzling over this for a while, however, Dierk Reiff solved the problem by synchronizing the 2-photon-laser microscope with the LED-screen at a tolerance of merely a few microseconds. The TN-XXL signal could subsequently be separated from the LED-light and selectively measured using the 2-photon-microscope. "At long last, after more than 50 years of trying, it is now technically possible to examine the cellular construction of the motion detector in the brain of the fly", reports a pleased Alexander Borst, who has been pursuing this goal in his department for a number of years. Just how much remains to be discovered was realized during the very first application of the new methods. The scientists began by observing the activity of cells known as L2-cells which receive information from the photoreceptors of the eye. The photoreceptors react when the light intensity increases or decreases. The reaction of the L2-cells is similar in that part of the cell where the information from the photoreceptor is picked up. However, the neurobiologists discovered that the L2-cell transforms these data and in particular, that it relays information only about the reduction in light intensity to the following nerve cells. The latter then calculate the direction of motion and pass this information on to the flight control system. "This means that the information "light on" is filtered out by the L2-cells", summarizes Dierk Reiff. "It also means, however, that another kind of cell must pass on the "light on" command, since the fly reacts to both kinds of signals." Now that the first step has been taken, the scientists intend to examine - cell by cell - the motion detection circuitry in the fly brain to explain how it computes motion information at the cellular level. Their colleagues from the joint Robotics project are eagerly awaiting the results.